NFL League Franchise Assures Construction of Stadium for Portsmouth Spartans (8 April 1929). The Portsmouth Times newspaper provided extensive coverage of the Spartan's entrance into the NFL and the "fight" for construction of a suitable stadium. Here the Universal Stadium Company confirms its plans to build upon news that the Spartans will receive an NFL franchise. League Franchise Assures Stadium Here: Vote Revision in Articles of Incorporation; Ask Secretary of State for Papers to Operate as Profit Concern. To Issue Stock. Plan to Sell 150 Shares, No Par Value; Notes Secure League Permit. Action was taken by the board of directors of the Portsmouth Football Association Tuesday which virtually assures the Portsmouth Spartans a place in the National Football League, one of the most selective groups of professional football teams in the United States. The decision practically writes a guarantee that the long fought-for stadium will be built on Labold Field, and will be ready for use when the football season opens this fall. The men agreed at the meeting yesterday to sign a note for $2,500, which will be put up immediately as an entrance fee to the National League. Manager Harold W. Griffen made formal application Wednesday to Joe Carr, president of the league, who advised that the Spartans might go ahead making arrangements for the coming season the same as if the team had been formally accepted. Until Tuesday the fate of the stadium was hanging in a balance as the Stadium Corporation announced that they would not go ahead with the project unless the Spartans entered the National League. They were of the opinion that without National League teams to play here the Spartans would not be able to draw sufficient of a crowd to support a stadium. As soon as the agreement was made to sign a note as an entrance fee to the league, the stadium people, who attended the meeting, stated that they were ready to go the limit with their plans and that as soon as the city awarded them the lease on the field they would begin work. The granting of the lease on the Labold Field will mark the close of more than a three-year fight for an athletic stadium here. At first popular subscriptions to build a stadium failed, then three bond issues failed when the matter was brought before the voters. A private enterprise has agreed to go ahead with the work and accept the responsibility. 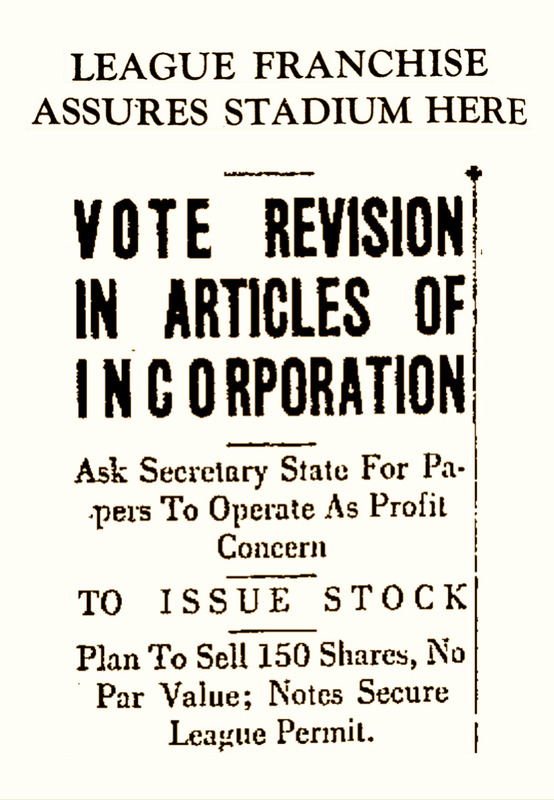 With the decision of the directors to enter the league the members of the association also decided to change the articles of incorporation and, instead of being a corporation for operation without profit, they will ask the secretary of state to grant them corporation papers for operation as a profit-making concern. One hundred and fifty shares of stock will be issued at no par value, which will be sold to Portsmouth people at $100 per share, to provide $15,000 of capital stock. Manger Griffen announced Wednesday that he can promise the football fans some of the greatest attractions in the country this season. He is already after games with Benny Friedman and his famous New York Giants, the Green Bay Packers, champions of the National League last season, and with the Chicago Bears and several other big teams. The Spartans have been told that they will have eight league games, four in Portsmouth and four abroad. The Ironton Tanks and the Ashland Armco Teams will also be on the schedule this fall. An announcement will be made in the near future as to when the season tickets will be placed on sale.